Has anyone tried this? The "inverted" mounting position on the gear lever looks like it will hit the swing arm pivot.. Any tips? Or is the solution to invert the arm on the shifter and get the conversion harness? It doesn't allow for GP shift. 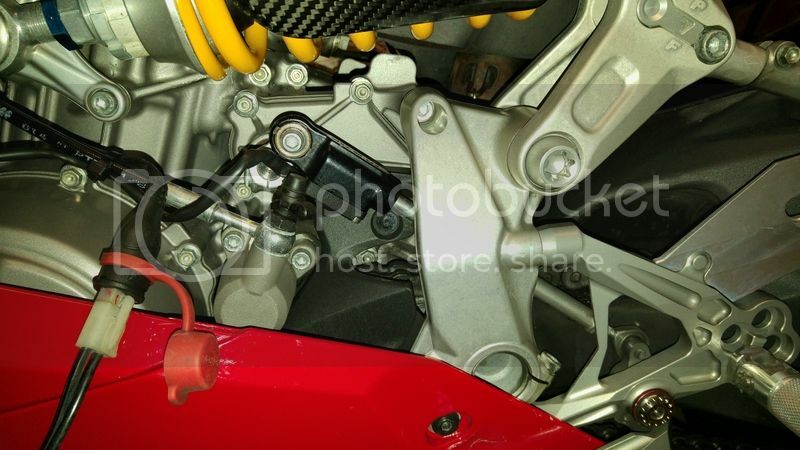 You need to get the gp shift kit from ducati to get it working with the rearsets. It is fairly cheap for the 1299. I wonder if you could just swap the leads..
Is it a 3 wire connection? Last edited by tadashi; Oct 14th 2015 at 03:04 PM. it will work i have these rear sets and just put them on to my 2015R. Someone made a post a while ago about grinding the gear selector arm a little bit in order to avoid the rod hitting the bracket? Anyone knows who that was? I just got a set of these and mine have 2 mounting holes on the shifter arm so should do race shift. Not sure if they redesigned them maybe. Does this cause clearance issues still?